The best quality denture adhesive often comes from well-known and reputable companies and the optimal choice should be easy to use. No one wants to struggle with applying their denture adhesive while getting ready for their day. Our top pick, Secure Denture Bonding Cream by Dentek, is an excellent example of a quality denture adhesive that has all the qualities you want in a good adhesive. Users that choose this denture adhesive from Secure will not have to worry about their dentures coming loose during the day; one of the biggest worries of denture wearers. Application is easy and dentures stay secure for up to 12 hours. The number of people who wear dentures is growing. Health problems, lack of oral hygiene and age are all contributing factors. Because of these adverse factors, many people end up having to wear dentures which are essentially a set of false teeth. One of the most important things a denture wearer needs is a good denture adhesive. This adhesive holds the dentures in place so they don’t move around or even worse, fall out while the wearer is talking or eating. Without a good adhesive, dentures can shift frequently and cause the wearer’s gums to change shape. The proper adhesive will prevent this gum issue and also prevent any embarrassment the wearer might have regarding their dentures. There are many different options available when it comes to denture adhesive. With a multitude of choices on the market, choosing the right product can be overwhelming, especially if you are new to wearing dentures. This guide will help you understand what you need to look for when researching the right denture adhesive for your needs. 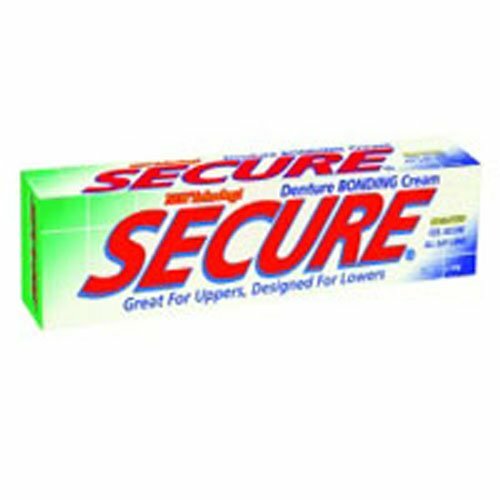 Secure denture bonding cream is a reliable adhesive that creates a strong, secure bond between your gums and your dentures and helps you feel confident when you are out and around others. It does not wash out when you are eating or drinking and will not affect the flavor of your food or drink. Saliva and liquids do not adversely affect the properties of Secure Denture Bonding Cream. This denture adhesive is zinc free and has a powerful, 12-hour holding capability. Particles will not leak into your stomach and cause upset. In addition, all ingredients contained in this adhesive are food grade ingredients. This product will provide you with a natural feeling as you wear your dentures which can help you overcome any self-consciousness that might occur. Speak, laugh, eat, and drink freely, without worry. You can purchase 4 packs of Secure Denture Adhesive and since you usually only need to use it 1 time a day, this is an excellent value. 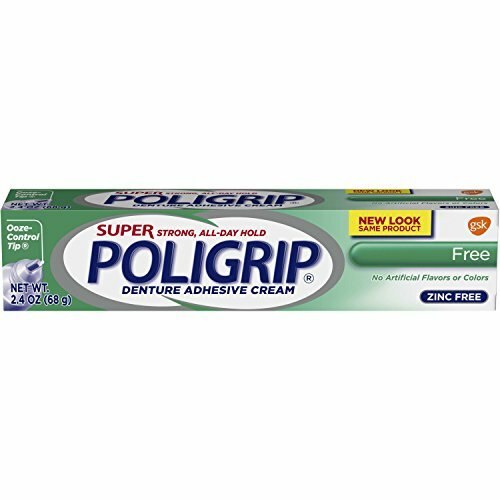 Poligrip is a well-known brand in denture adhesive that has been around for a very long time. This Super Poligrip Denture Adhesive Cream is free of all artificial colors and flavors. It is also zinc free. This adhesive will keep your dentures secure and tight for hours. It forms a strong seal that keeps food from getting in between the dentures and your gums which can cause discomfort and irritation. The ooze-control tip prevents messes during application. Super Polygrip will keep your dentures in place for up to 12 hours at a time. This will vary from person to person and depends on the fit of the dentures, the amount of saliva in the mouth, and what they eat and drink. With the strong and secure hold this product offers, self-consciousness will be a thing of the past. There are 4 boxes of super poly grip in this package which is a great value. Fixodent is another well-known and long-standing name in the denture adhesive industry. This adhesive powder provides denture wearers with a great fit for their dentures along with an airtight seal that is super thin. This airtight seal prevents any food particles from getting between your gums and the dentures. It will feel completely natural and secure. The easy-to-apply powder is very convenient. It is a great choice for both partial and full-denture wearers. Use it once a day, then eat, drink, talk and laugh with confidence knowing that your dentures will securely stay where they belong. 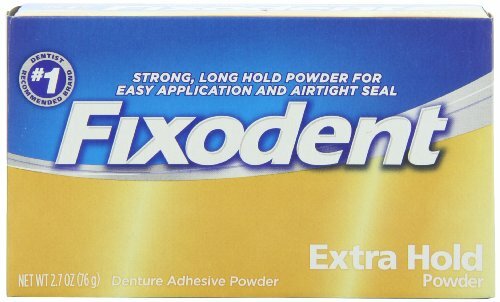 Fixodent is the number-one, dentist-recommended brand for denture adhesive and the company provides their customers with a 60-day, 100% satisfaction guarantee. If you are not satisfied for any reason you can return the product. There are four packs of powder in this package for your convenience. They have no artificial colors or flavors, they are from popular and well-liked brand names with proven reliability, they are easy to clean up, apply and more. Any of them would be a great choice for keeping your dentures securely in place. To learn more about choosing the perfect denture adhesive for your specific needs, read the buyer’s guide below. The information in this guide will help you be sure to look at the most important criteria when researching products. Having the right information will help make the selection process much easier, less stressful and worry free. When you are looking to choose the best denture adhesive for your needs there are several factors you need to look at before you purchase. It is important to gather a variety of details about the different adhesives you are considering, including the adhesive’s features, pros and cons, benefits, as well as customer opinions. These factors will help you educate yourself so that you can rid yourself of the products that don’t fit your needs and make an informed decision that you will be pleased with. There are many different types of denture adhesive to choose from. Which one you choose is a matter of personal preference. You may find one type easier to use than another. It may benefit you to try a few different types to see which one provides the fit and ease-of-use you are looking for. Cream tends to be the most commonly used adhesive since the hold is the strongest. However, some wearers don’t like the difficulty of removing the glue from their mouth whereas other people don’t mind it at all. Once you find the type of adhesive you like, consider yourself lucky and stick with it. There is nothing that states you must use a variety of adhesives once you find something that works. Paying attention to useful information, details and the pros and cons of certain denture adhesives can be beneficial in choosing the perfect product for your needs. Below we have listed the most important factors to consider when you are looking for your denture adhesive. Ingredients – Some of the top denture adhesives on the market contain zinc. While there are some benefits to zinc, too much can be dangerous and can potentially cause an overdose. Zinc can even cause nerve damage if the overdose is high. You want to be sure your adhesive doesn’t contain zinc, which eliminates the worry altogether, or that it only contains the amount it is supposed to contain and nothing more. Make sure that you know how much Zinc the denture adhesive you are considering contains. Cost – Cost is always a factor when researching different adhesives. People don’t like to waste their money and making a purchase of something that doesn’t work is frustrating. However, you don’t want price to be the only factor you look at when deciding. There is nothing wrong with taking advantage of a great value if the product’s quality is top notch. There are many great products on the market. Three of them have been reviewed by us in this guide and all of them are reliable, great-quality products with affordable prices. It is usually cheaper to buy packs that contain more than one tube; you end up paying less per tube than if you buy single packs. Size/weight – There are several different sizes of adhesives from which to choose. You might be able to get an better deal per ounce by purchasing a larger tube or by looking for packs that contain 2 or more tubes. Once you decide on the right denture adhesive for your needs, buying a pack that has multiple tubes can save you money. Comments and Reviews – This is one of the best ways to get some great, personalized and detailed information about the adhesive you are considering. Consumers love to share their experiences with products and you can use these comments and experiences to learn things about the adhesive that the sales site may not tell you. Things you’d really like to know such as how well it really holds, how easy or hard it is to apply, and anything else the customer notices when using the product. They will be very candid about their experiences and this is exactly what you need to further narrow your choices. Star Ratings – Star ratings are shown on many sites and are another way to discover valuable information on your product. A high star rating usually means that the product is well-liked. It is not advisable to choose a product with less than a 4-star rating. A 4-star rating is good and means that most people who purchased and tried the product have given it a good rating. The higher the number of stars, the more popular and liked the product is. You should avoid using a denture adhesive to try and secure extremely loose dentures. While it’s not always possible to get completely secure dentures that don’t move at all, loose dentures are another matter which should be checked out by your dentist. Not getting your denture’s fit checked and continuing to use increasingly more adhesive can lead to mouth problems such as thrush, oral irritation and even ulceration. Doing this can also increase the rate of bone loss which will actually make your dentures looser in your mouth. Denture adhesive continues to be in high demand as it is necessary in helping denture wearers secure their dentures in place. This simple-sounding task is very important for keeping dentures comfortably in your mouth. Not all wearers use adhesive as some don’t need it, but if you are among the millions that prefer the extra security of adhesive you will find that there are plenty of choices out there. You are sure to find one that you like. The following is an overview of the important points we have gone over in this guide. They will be even more helpful when you start your research. Decide on a type of adhesive you’d like to try from the available varieties. You will also want to pay attention to cost, value for size, and any other points that are important to you. With so many choices and types available, there is no reason you won’t be able to find an adhesive that works perfectly for all your needs. With this you can continue to enjoy leading a normal life where you are not worried about your dentures sliding around during conversation or food. The information in this guide will make sorting through the choices and eliminating the ones that don’t meet your needs much simpler. You’ll be choosing the right one for your specific denture needs in no time and will be confident that the choice you made is the best one for you.